Many of the country dances are taken from the works of the dancing masters John Playford, Thomas Bray and Nathaniel Kynaston whose works were widely reproduced during the 17th and 18th centuries. Bath Minuet Company also recreates dances choreographed by lesser known dancing masters. Many country dances may be danced with or without the use of complex step patterns which makes them ideal for audience participation. 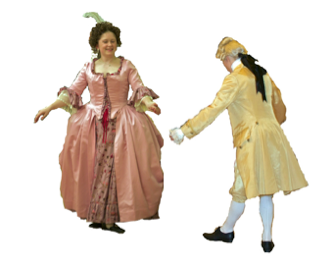 The formal court and theatrical dances of the baroque period included more sophisticated dance forms and rhythms. Please refer to our Performances & Bookings page for contact information.